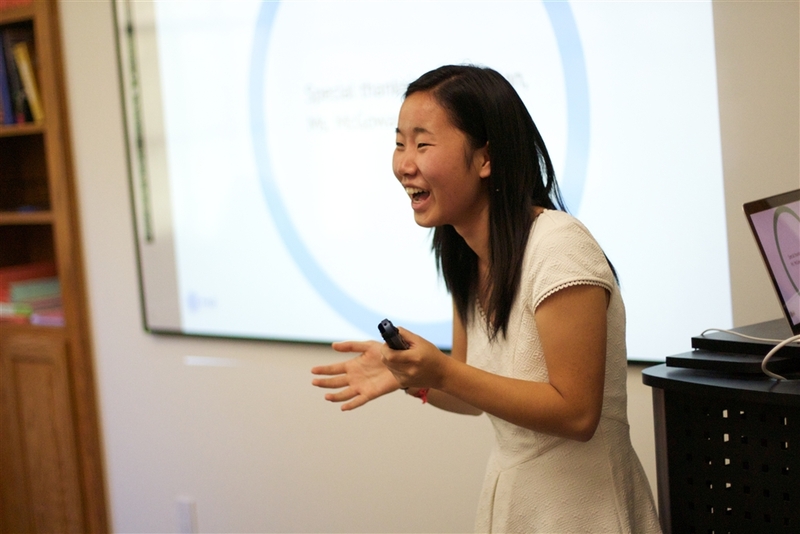 On May 27, 2013 Nu Xiong CdeP 2013 led a discussion among faculty on a number of issues regarding her perceptions of diversity at the school. Over her years at Thacher, she constantly examined and reflected on diversity and multiculturalism on campus, specifically focusing on students of color. Her initial personal reflection began as a two-page free write in February of her senior year, and then grew into a twelve-page paper that included student input and academic research. She wanted to look at the school’s current approach to understanding diversity and then offer proposals that she felt would help Thacher better support all nontraditional students. She shared the document with the members of the administration, and after discussions with Mr. Mulligan she was encouraged to share the document with the faculty. After the faculty had a chance to read and reflect, Nu was invited to speak to the faculty in May and to present her ideas for consideration. At the start of the 2013 – 2014 school year, the faculty participated in a professional development session that focused on the issue of diversity. Led by Head of School Michael Mulligan, the faculty examined several case studies from other schools across the county to best discuss how Thacher could continue to improve upon its own diversity initiatives and to foster important conversations necessary in our diverse community. What follows is an edited version of Xiong’s proposals for the school. Nu Xiong CdeP 2013 presents her senior exhibition project to a captive audience. Thacher has changed a great deal from the school Mr. Thacher founded in 1889. The young and adventurous souls who venture into the Ojai Valley and ride in the saddles at Thacher are no longer primarily young, privileged white males. Today, Thacher’s 240 students come from 25 states and 11 countries, and represent diverse cultural and socioeconomic backgrounds. In light of this change, Thacher has developed a racially colorblind culture which functions on the belief that by ignoring racial and cultural differences, a community can experience greater harmony and equality. On the surface, colorblindness is a desirable and appealing model for a community. However, though well intentioned, the irony is, that the effects of this phenomenon can be harmful and often work against minorities at Thacher, particularly for students of color. Although Thacher is an open and accepting community, students of color nonetheless have to adapt to the culture of the majority and many (especially those that come from lower socioeconomic backgrounds) experience a huge culture shock upon arrival. Colorblindness leads the majority to believe legitimate differences do not exist among students, stunting discussion essential to the identity formation and welfare of students of color. Failure to engage in conversation about diversity sends the message that race is not important and that the problems of students of color are insignificant or don’t truly exist, tragically silencing the authentic and diverse voices of students. When students at Thacher do draw attention to race, their perceptions of racial groups are often that of mainstream stereotypes, which are hardly ever accurate. Regardless of whether or not one may take offense, telling someone that they are “so Asian” is blatant stereotyping. Since when has it ever been acceptable to say to someone, “you’re so White”? Or Black, or Hispanic, or Native American? Other common incidents of pervasive ignorance and stereotyping include being called the wrong name by fellow classmates and teachers multiple times, having to explain to peers that not all Asians are Chinese or Korean, and being asked questions such as, “Where in Mexico is Ecuador?” or “What is it like to be on a scholarship?” Without discussing issues of diversity, Thacher’s colorblindness can perpetuate stereotypes, ignorance, and racism. Additionally, many believe that being “colorblind” correlates with being unbiased and unprejudiced. Whether or not this is necessarily true, making such a claim consequently impedes on an individual’s likelihood to engage in critical self-reflection. More specifically, individuals from the majority do not seek to examine the ways in which they are privileged and are less likely to feel a responsibility to recognize and challenge those who are indeed prejudiced. If individuals are unable to identify and confront racism, they contribute to the cycle of inequality and oppression. As a school that prides itself on training students to become knowledgeable, independent, and effective leaders, Thacher should seek to empower all students to actively challenge discrimination of any form. On a larger scale, colorblindness can also be used to deny racial privilege, mask institutionalized racism, and affirm majority dominance. Clearly, colorblindness is greatly flawed and is often not in the best interests of students. As it currently stands, Thacher’s community is already both a safe and nurturing environment for all students. The school is clearly is committed to creating a more diverse community, but what is equally important is taking the time to understand and appreciate the differences that exist within. Great schools remain so by understanding the true nature of their strengths, honestly appraising their points of vulnerability, and relentlessly pursuing improvement. If Thacher is truly dedicated to bettering itself, preparing all its students for the “diverse and changing world” as stated in its mission, and preserving its place as one of the most sought-after independent schools in the country, then it needs to take a more realistic and holistic approach to understanding diversity. It is not about placing blame, or a matter of majority versus minority. It is about uniting in the celebration of our differences and strengthening the connections we share with our friends and family. It is about understanding the people we care about beyond what meets the eye—to know and see someone as a whole person. It is about honor, fairness, kindness, and truth. Showing a continued commitment to recruiting students that come from a wide spectrum of racial, cultural, socioeconomic, and geographic backgrounds. Hiring a more diverse faculty and staff in order to provide role models and support for all “non-traditional” students. Training and developing faculty to be better prepared to lead discussions on diversity. Recommended action steps:Integrating multicultural education into the curriculum of classes in order to more inclusively and accurately reflect the diverse perspectives and backgrounds of Thacher’s student body. Annually observing and celebrating Martin Luther King Jr. Day through the facilitation of faculty-led workshops. In the last four school years, Thacher has had only two half-day events that focused on multicultural issues (MLK Jr. Day 2009 and 2013). These events involved a one-hour workshop and lunch. Again, this should be an annual event and should expand in scope in the coming years. Bringing back Cultural Weekend as an annual event, and expanding it beyond high culture trips. This could be a great opportunity to expose Thacher students to diversity in the real world. Establishing an orientation program for freshmen and all new students that emphasizes awareness of diversity. Through this program, students can:Providing more opportunities for Thacher students to collectively engage in discussion about past and current issues of diversity, which encompasses age, ability, race, socioeconomic status, gender, sexual orientation, religion, and ethnicity. Reassessing the mission of UCT and working collaboratively with faculty to achieve greater club legitimacy. Recommended action steps:Supporting a forum where students of color, in similar fashion to the Christian Fellowship Club and Spectrum, can regularly talk and share with the faculty and administration their issues of interest and concern. It is crucial that students of color, as they navigate the complex realities of race, can find support from individuals who have dealt with or are dealing with a similar experience. Securing a Community Council seat for a UCT representative; the clubs currently represented in the CC are the Indoor Committee, Environmental Action Committee, and Community Service.